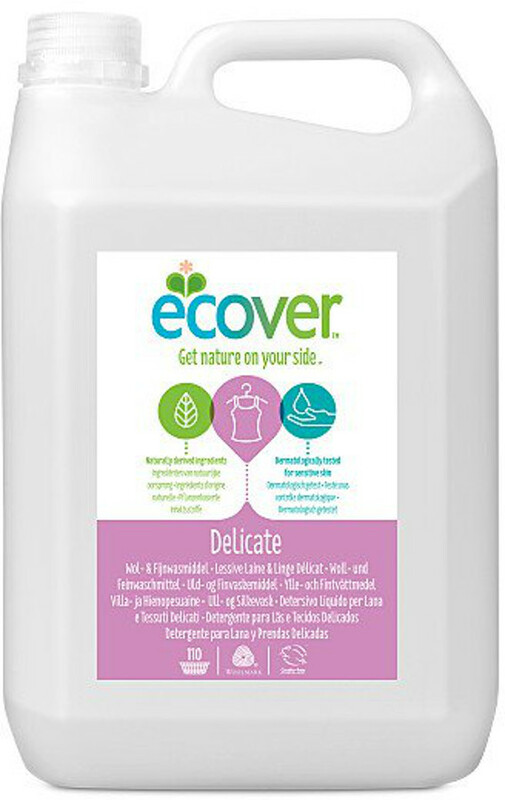 Ecover Delicate Wash is ideal for fine fabrics, silks and woollen materials. Used either in your washing machine or as a hand-washing cleaner, it is designed to preserve the softness of delicate fibres and protect their colours. Gently perfumed with plant based ingredients, this Delicate Wash will leave your garments clean and fresh. Its quick and complete biodegradability ensures this wash's environmental credentials, and it has minimum impact on aquatic life. The packaging itself is made from polyethylene and polypropylene which are 100% recyclable using a low energy process. Buy in bulk to reduce packaging and waste - it's better for your pocket too! For machine washing: pour 1½ capfuls (45 ml) of Ecover Delicate into your machine's dispenser. Run your machine as per the manufacturer's instructions. 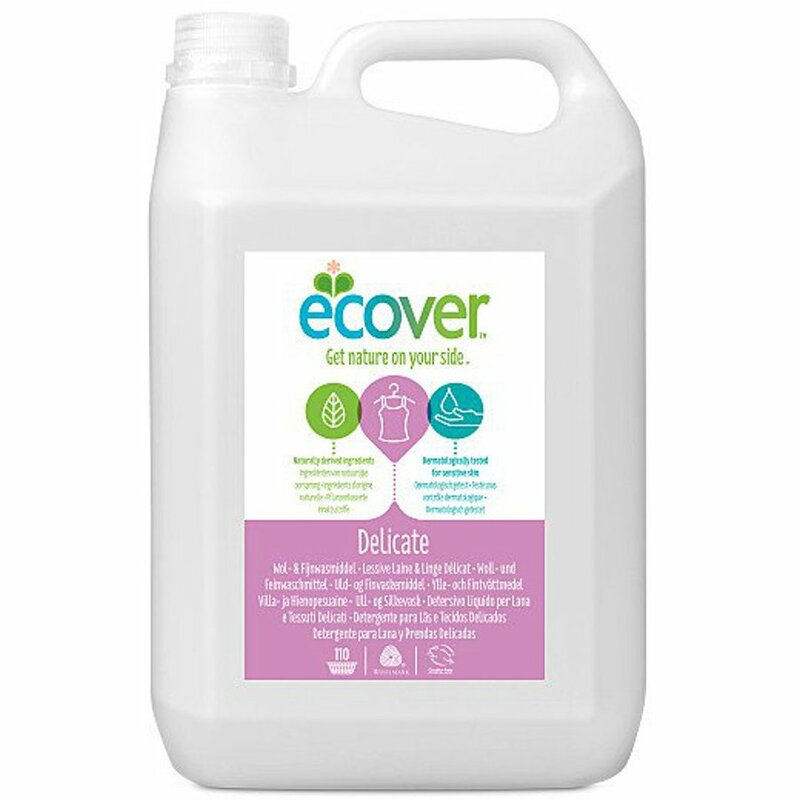 For hand washing: dilute 2/3 capful (20 ml) of Ecover Delicate in 5 litres of warm water. Wash your garments as normal. 5L lasts up to 110 washes. The Ecover Non-Bio Delicate Laundry Liquid - 110 Washes - 5L product ethics are indicated below. To learn more about these product ethics and to see related products, follow the links below. Really delighted to be able to buy this product in bulk. My local wholefood co-op offered Ecover refills for many years but they have now stopped stocking it, and the replacement they are offering isn't up to the standard of the Ecover original. I have skin problems, especially on my elbows, and bedlinen washed in 'conventional' detergent - or even 'eco' detergent which is overly perfumed - can cause a painful flareup. Longsleeved nightwear washed in Ecover delicate is a surefire protection when I am staying away from home. Since it isn't for very dirty items, it's perfectly good, and I've never been able to find it in ***. This problem applies to the stain remover, which is better than any other, and which seems to be no longer stocked (locally anyway). Also, it's cheaper to buy the Ecover products I like in bulk with you. There are currently no questions to display about Ecover Non-Bio Delicate Laundry Liquid - 110 Washes - 5L.